We offer digital X-rays! With digital X-rays, there is no delay while images are being developed. In addition, the state-of-the-art technology lowers your exposure to radiation by 75% as compared to conventional non-digital X-rays. A simple digital sensor slipped inside your mouth also makes possible true panoramic imaging displayed on a screen and ready for viewing. 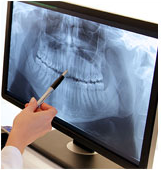 Digital X-rays provide amplified views that are not possible with traditional film systems. Without changing the original data, images can be enlarged, sharpened, rotated, or colorized. With digital files, recent images can be superimposed over prior images to expose changes to dental health. As an added benefit, no developing chemicals are needed, so this style of X-ray is also environmentally friendly.